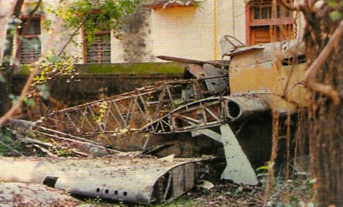 IN MARCH 1982 Peter Vacher, a noted restorer of vintage Rolls-Royce cars who was cataloguing Rolls-Royces which had belonged to various Maharajas, stumbled upon a derelict fighter in a compound in northern India. The fuselage was standing on its wheels and the propeller, wings and tailplane were laid on the ground. 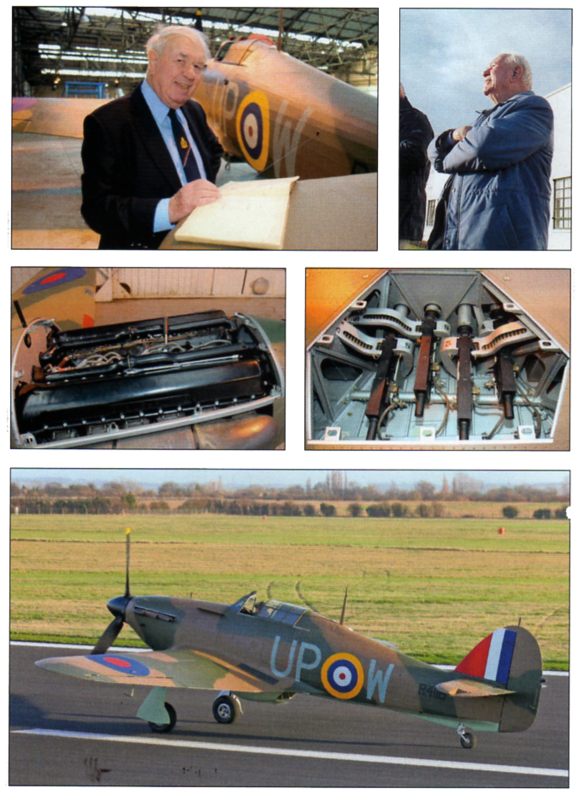 Intrigued, Peter noted the serial number, R4118, and back in England he discovered that it was a Battle of Britain Hawker Hurricane. 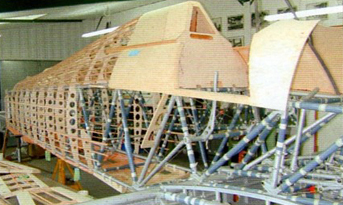 The idea of recovering the historic fighter remained with Peter, and in 1996 he made an offer for it. The Hurricane as it was discovered in 1982 by Peter Vacher, at Banara Hindu University, in the city of Varanasi (formerly Benares). The Hurricane had reached India by ship in early 1944. Intended for use as a training aircraft, it was not needed and remained in its packing case at Bombay until 1947. Struck off charge, R4118 was donated to a university at Varanasi (Benares) for engineering instruction. Over the following decades thousands of students worked with R4118, but none could have known of their training aid’s illustrious past. 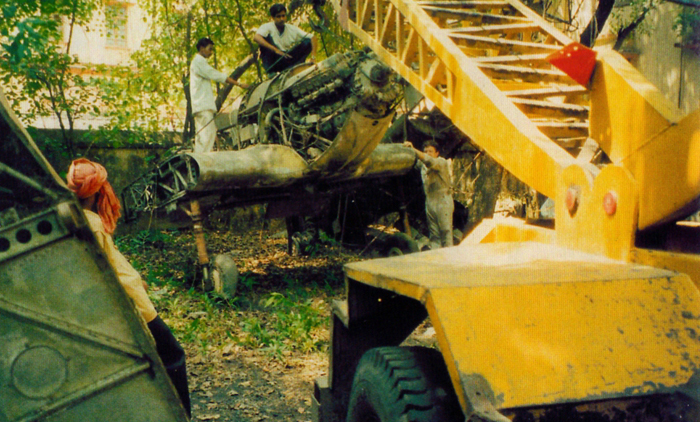 Hurricane R4118 is removed from Banara Hindu University at Varanasi, India in June 2001. Delivered new to No 605 (County of Warwick) Sqn at Drem, Scotland, on August 17, 1940, R4118 was flown south by Plt Off C.F. “Bunny” Currant with the rest of 605 Sqn to Croydon, Surrey on September 7 that year. At Cambridge Airport on January 13, 2005, former 605 Sqn pilot Bob Foster took up the story: “Croydon had been pretty badly bombed; it was all a bit chaotic. We didn’t fly for two or three days.” Bob, who had just vacated the cockpit of the recently-restored R4118 eagerly scanned his wartime logbook for references to the machine: “September 28, 1940. I flew R4118 four times that day”. On the second combat patrol, while he was flying as Red 2 to Plt Off Eric Wright at 10,000ft south of Tunbridge Wells, Kent, a lone Junkers Ju 88 was spotted flying east at about 15,000ft. Climbing and turning on to a parallel course, Eric and Bob pressed home their attach, and the damaged Ju 88 was last seen diving into cloud south of Beachy Head. It was claimed as a probable kill. Four days later, on October 1, Bob, again in R4118, found another hapless Ju 88 flying south over Surrey. This time there was no doubt about the bomber’s fate, as it plunged vertically, a confirmed shared kill. 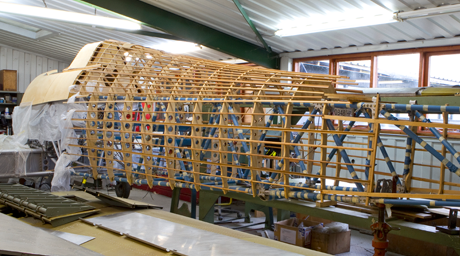 The rebuilding of the fuselage structure approaches completion in the Hawker Restorations workshops at Milden, Suffolk, during the summer of 2003. 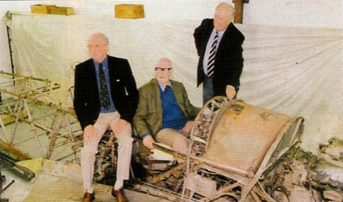 Shortly after it arrived in Britain, in the summer of 2001, three former 605 Sqn pilots who had flown R4118 were reunited. Left to right: Peter Thompson, who died in 2004, Christopher F. “Bunny” Currant and Bob Foster. Pictures Above : Bob Foster checks his logbook on the tailplane of R4118. On September 27, 1940, Bob damaged a Messerschmitt Bf 110 while flying another Hurricane, but took some hits and had to force-land at Gatwick. During the same action, Plt Off John Milne shot down another Bf 110 in R4118. The following day Bob damaged a Ju 88 in his replacement Hurricane, R4118 : Bob watches his old Hurricane take off at Cambridge Airport on January 13 : The 1,030 h.p. Merlin III engine : R4118’s original Browning machine-guns : Stuart Goldspink taxies R4118 back in. 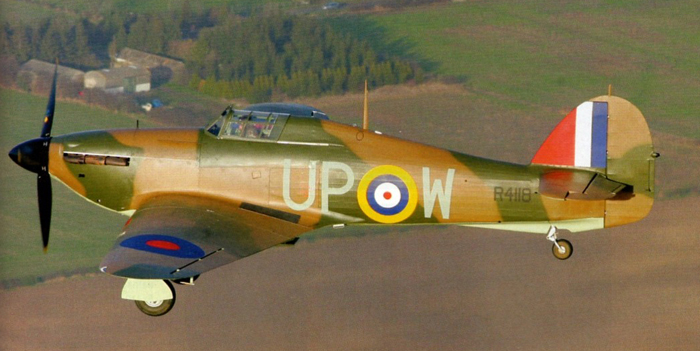 Stuart Goldspink flies Hurricane R4118 near Cambridge on January 13. On October 22, 1940, R4118 suffered battle damage on its 49th sortie from Croydon, and went for rebuild. 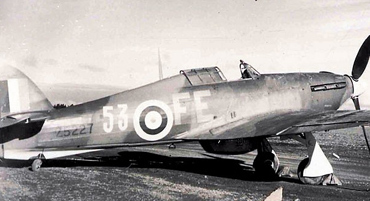 It returned to Scotland on January 18, 1941, being delivered to 111 Sqn at Dyce, near Aberdeen, from where it was flown on patrols over the North Sea and again saw combat. Over the following two years it was used primarily for training, and was rebuilt three more times after major accidents. In December 1943 R4118 was crated at Cardiff docks and despatched to India. ot Pete Kynsey at the controls. Fellow TFC pilot Stuart Goldspink was at the helm for the official launch, on January 13. 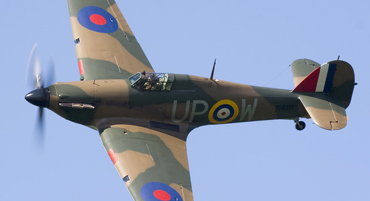 The machine will now undergo 5hr of flight testing with four nominated pilots, the other two being Shuttleworth chief pilot Any Sephton and ex-Battle of Britain Memorial Flight (BBMF) pilot Al Pinner. As befits one of the most historic surviving Second World War fighters, R4118 will be flown under BBMF rules, with no negative-g manoeuvres. After R4118 taxied in on January 13, a visibly moved Peter Vacher said: “I can’t quite believe that, 22 years after discovering her in India, R4118 is ‘operational again’, and Bob Foster has been sitting in her this morning doing a bit of ‘hangar flying’. It’s a bit of a tear-jerker”. 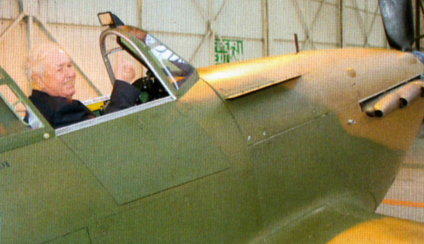 Bob Foster gives the thumbs-up from his old “office” in the Marshall’s hangar at Cambridge Airport on September 13. In January 1943 Bob joined 54 Sqn on Spitfires at Darwin. He shot down a Mitsubishi Dinah and at least four Betty bombers, and damaged a Zero.